I must admit that I procrastinated on setting up a will, much like many others. Ideally, an experienced, skilled estate lawyer would create something customized to your situation. But it is not always clear how to find such a person, or know what a fair cost would be. Maybe we just don’t like the idea of thinking about death. If you don’t create a will, your state already has a default plan in place (look up the intestacy laws in your state) and it may not be what you would have chosen. Do you want a stranger appointing the guardian of your children? I tried to think of it as a gift to my family. A reader recently told me about Willing.com, a new website that promises a free, legal will in about 10 minutes. Is such a service a good idea? I’d never heard of Willing before, but the other software costs $35 and up, so I took it for a little spin and took a bunch of screenshots (click to enlarge). Overall, the interface was very pleasant and modern and mobile-friendly. First, they will ask some basic information about you and your family. Names, genders, zip codes, and birthdates, but not Social Security Numbers. I suppose they aren’t required legally? At least it’s one less source of identity theft to worry about. Who do you want to carry out your wishes? When you’re done with the questionnaire, your will is created and customized to your state. You can then print or download your complete will as a PDF, and also create an optional living will. At no point do you see any advertisements nor do they ask for any payment information. 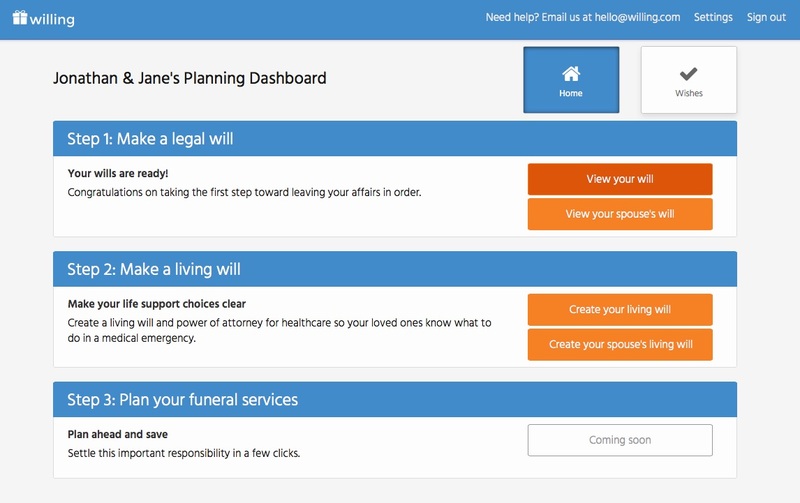 The last screenshot does provide a hint as to the future revenue model for Willing – perhaps they will set up a way for you to prepay your funeral expenses (relieving your family of some stress and money) and get a little cut of that. That sounds reasonable to me if they are providing the will for free. Of course, if you live another 50 years, will you even remember shelling out that money? I am not a lawyer and thus can’t vouch for the accuracy or quality of the will contents. As the Consumerist article states, one thing to worry about is outdated information if their software isn’t updated regularly. The final instructions tell you to sign the will along with two valid witnesses and that a notary is not required for the will to be legally binding. The final document produced was only three pages long, although my theoretical situation was pretty simple. As I read through it, I started to see how such software would eventually become free. Indeed, while researching this post, I found several other “free will makers”, although Willing.com had the best user interface and had the least amount of annoying ads. It may not be optimal, but at least going through the Q&A process will make you aware of the various issues you need to think about. Who will take care of your kids if your spouse dies? Who is your backup heir? Your backup estate executor? Maybe just starting the process of putting your wishes down in writing is a good thing. Otherwise, I can see someone with a simple situation using this software, but don’t know if I could recommend such a service to my friends. If I really cared about how my estate was handled (i.e. I had a significant net worth and/or dependents), I would recommend hiring a lawyer instead. The question then becomes – Is there a better way to find a good estate lawyer than relying on word-of-mouth? As a (non-estate) attorney, I would caution using any Will template which is non-state specific. Many times, the state bar association, legal aid, or even some mega law firms will have an “X state will template” somewhere online for free or very low cost, if you’re feeling comfortable enough with going at it alone. Wills are one of the few things courts will treat as-is, as you’d expect a contract would be — if there are any errors in execution or technical items missing, a court will almost always void the entire document and apply the state laws of intestacy. Intestacy is generally not how most people want their property to be split up – many states reserve a significant portion of the estate to children (minors or adults), with a relatively marginal amount going to the spouse via operation of law. For example of will nuances, NC will probate handwritten wills, while other states won’t. Or GA does not follow the uniform rules on wills, which leads to numerous issues if not drafted properly, but also allows a self-proving will to speed up probate time/winding up an estate. And many Western states, many of which are community property states, will have issues when transferring property to someone other than your spouse. If you want the security and peace of mind for yourselves/your loved ones with a properly drafted, attorney-reviewed Will, a basic Will should cost not more than $500. MT: Thank you for your comment. We have a deep respect for the law and always welcome feedback from practitioners. Indeed, all of the documents made on our site are state specific. We track all of the relevant statutes in every state and the District of Columbia to ensure the quality of the documents made on our service. We care a lot about the quality of our service and have gone to great lengths to build a product we are proud to recommend and use ourselves. We also agree that there is no substitute for the personalize legal advice provided by a competent, qualified estate planning attorney. Unfortunately, as Jonathan mentioned, these attorneys are hard to find. Most charge significantly more than $500 per will. This is large barrier for most people who ultimately end up with no plan whatsoever. As you mentioned, this is not how most people would want their property divided. Let alone the issue of state appointed guardianship for minors. 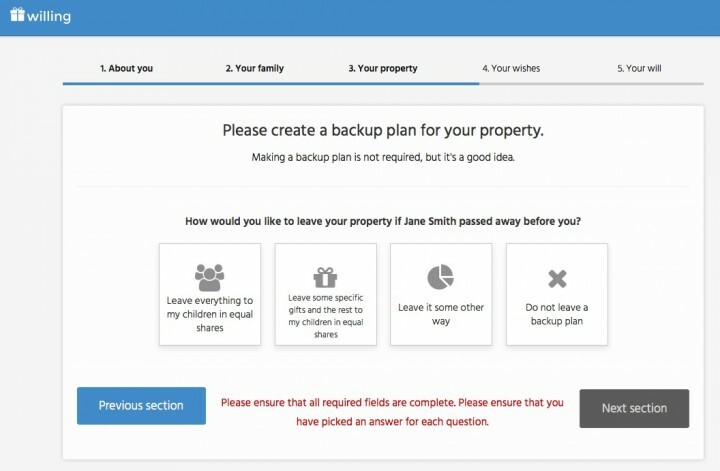 Like online tax filing, online estate planning is not for everyone – particularly those with very large or complex estates. However, we’ve found that Willing is a great option for the vast majority of people. Our documents are clear, thorough, state specific and drafted by world-class estate planning attorneys. Hello and thank you for taking the time to review our service. 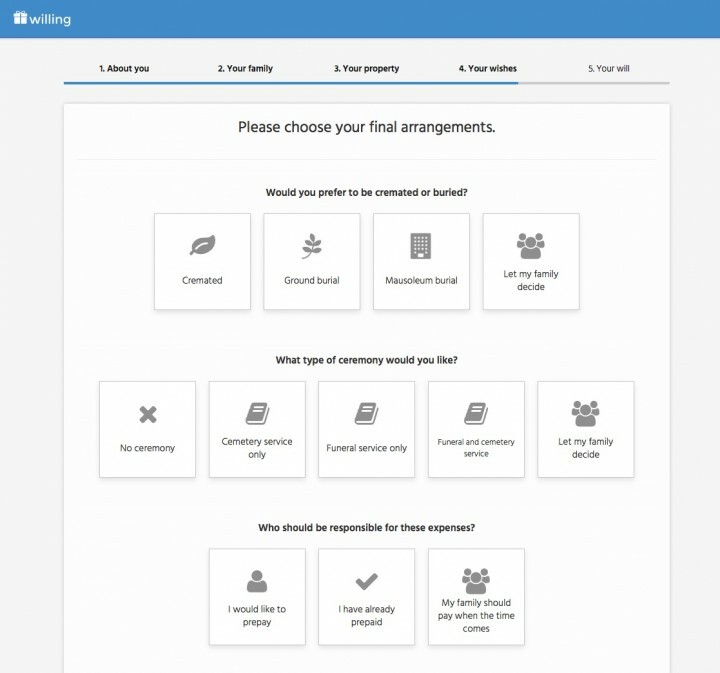 Willing was built in collaboration with some of the country’s best estate planning attorneys and we update it regularly to ensure it is compliant with the latest statutes in all 50 states and the District of Columbia. We’ve received strong reviews from consumers and attorneys alike and are proud of the quality of our product. Happy to discuss in more detail either in this post or via email at hello@willing.com. I think this type of innovation is desperately needed in the legal field. I think a big problem with wills is they are often unnecessarily complex – people relish doling out their money to many beneficiaries in very specific ways to the point that it is a burden on administering the gifts and often eats up the value of their contributions. Thank you for your comment Nick. We were surprised to learn that many of the most respected estate planning attorneys agree that many last will and testament documents have become unnecessarily complex. A well drafted will should be clear, thorough and legally binding based on the laws of your state. For most people, this can be accomplished in a handful of pages. If you have done your planning correctly, there should be very little that is transferred though your will. You want to avoid your states probate and the costs associated with probate. The will is only there to transfer anything that was not otherwise transferred by specifying account beneficiaries or though a living trust. Nice to see Willing giving their comments. I will be checking their site. My current will was done with Quicken/Nolo product. In my case, I see no reason to spend money with an attorney. I would recommend reading about estate planning and educating yourself, even if you choose to use an attorney. Check out the Nolo website and then get the book at your public library. abc: Thank you for your comment. Congratulations on being proactive about your estate planning needs! We are excited about making this important topic simpler and more accessible to everyone. Willing is quickly becoming the leader in the industry thanks to great feedback from our customers. We take the time to read every suggestion and would love to hear from you. Feel free to reach out any time at hello@willing.com. As an estate attorney in FL, I love programs like these. I make way more money fixing things than setting it up right to begin with. The fallacy is that you’re paying an attorney for a will (or trust, or lease, or any document, for that matter)…you’re not. You’re paying an expert to accomplish goals like “providing harmony”, saving money, protection from creditors, or planning for catastrophe. As in most things, the smart person knows what they don’t know and is happy to pay for expertise. PS: Willing’s reply to MT is laughably riddled with misinformation and clearly not written by an attorney/someone who knows what their talking about. As a fellow attorney, I respectfully disagree. The vast majority of people do not need expensive, customized estate planning counseling. They don’t have the wealth to merit considering things like a Beneficiary Defective Inheritor’s Trust – they just need a simple will. You seem to think it’s obvious that people should pay a large attorneys fee to get a simple will done. I say “large” attorney fee because if lawyers fees were not large, we wouldn’t see so many millions of Americans going without a will to their family’s detriment. Also, how should a lay person find a trusted lawyer? Rely on advertising? Is it possible to easily compare (by price and quality) different attorneys? I don’t think the average person believes this is the case, and there is good reason why public perception of attorneys is so low. Lawyers have created a cartel, have fiercely fought to keep barriers to entry despite the fact that the saturation of law school grads has done little to nothing to increase access to counsel by low and middle class families. It is not that dissimilar to the maligned local taxi cartels that have kneejerk opposition to any competitor who provides better service at a lower price. You say you are an attorney, thus implying that you graduated from law school and passed the bar, yet you have utterly failed to show any arrogance. What gives? Also, the fact that you have very clearly and succinctly stated exactly the problem that non-attorneys have when dealing with the legal industry, and done so without any run-on sentences, ambiguous words and phrases, or any apparent legal jargon. Seems like you are due for a visit from the lawyers version of the kkk sometime very soon. In short, can I hire you? Thanks TD! I can remember when attorney advertising was forced in Pennsylvania when Atty. Edgar Snyder of Philadelphia began advertising on TV in Erie County. The local Bar Association called him on the carpet trying to convince him he was hurting local attorney’s. He basically told them to take a hike. His innovation broke the cartel somewhat. Estate Planning is still expensive locally for us. I have been researching for 6 months! Locally, a Will and POA runs around $600.00 total for both documents and a Medicaid Trust, around $3,000.00. We recently got that quote after a local attorney gave us a free consultation of almost two hours. Nice deal for us. But, he practically ignored the Will, POA and Trust documents I already prepared, said our estate was too small ($200,000+) and “convoluted,” and wanted to prepare documents from scratch. No thanks. 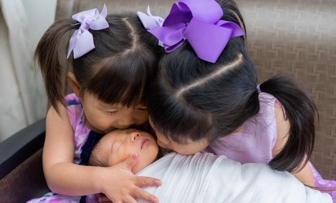 I am looking into using KISS Trust services as Trustee but still need an attorney to act as Executor to wrap up the estate when the survivor of us (my wife or me) dies. We plan on cashing out our IRA’s over time to avoid taxes and deeding the house to the Trust soon to escape the Medicaid 5 year look-back rule of we live that long LOL! Household items will be sold and cash transferred to the Trust. We don’t want to have anything of great value left to leave anyone. I went on too long. Sorry. But I hope readers benefit. Steve: Thank you for your comment. We have a deep respect for the law and always welcome feedback from practitioners. Indeed, this is why our service was built in collaboration with experienced estate planning attorneys. We’ve worked hard to build a quality service and stand by the accuracy of our responses. For reference, below is a recent article from the American Bar Association confirming the average rate for partner attorneys is $536 per hour. Also below, is an article from legal research firm LexisNexis confirming that 56% of Americans do not have any kind of estate planning documents in place and that cost is among the top reasons for not creating one. We built Willing to help these families and are proud of the impact we are having. Please email us at hello@willing.com if you have any specific suggestions on how we can improve the service. Steve, it seems like an attorney would know the difference between their and they’re. You’re awesome! I was thinking the same thing…hahahah. Even two years later… yes, it was noticeable and even noteworthy since it gave a note of irony due to the tone/ slant of the response. Wow, I’m glad to be informed of this service. I’m hesitant to completely trust the drafting of the will to a software but nonetheless, I hope it will be at least informative. It’s my understanding that wills have to be state-specific, and ideally, assets should pass outside of probate to minimize the complications that my beneficiaries have to deal with. The nice thing about using a software to write the will is that it’s probably very cheap/free to change the will over time. I’m still young and don’t have that much assets yet. But in time, this type of service will probably become more and more important to me. I started answering the questions on Willing.com and after the first page my gut told me to stop. I don’t know anything about WIlling.com. They are asking for private information that could be used for identity theft. Why would they need my birthday? I also noticed that this service is free and there is no advertising on the Willing.com website. So, how does WIlling.com make money? Either they are selling my personal information to other people or they are going to use my private information for identity theft. Nancy: Thank you for your comment. As you noted, making a will on Willing is completely free and we do not share your information with advertisers. We will soon be launching additional paid features which we expect many of our customers will find useful. You should also know that the main reason why we ask you date of birth is to ensure you are over the age of majority of your state in order for your will to be legally valid. Please let us know if you have any questions by writing to hello@willing.com. I thought I would add, I am single I did not need a living will as I already had one. so I do not fully understand the costs. the will which was the first thing I did was lets say 49.00. the next part I did as I wanted the Lady Bird document to avoid probate for my home … there was no ability to not choose living will even though I already have one, The last document I did was power of attorney. those last 3 documents it seems cost me 150.00 in addition to the first cost.. while I found your site very easy to use, your pricing to me was confusing. it did not take into consideration that I had already paid,, the first amount. Even if it’s just them protecting themselves, it’s pretty bad that there they essentially say they don’t protect my personal information and that of my family. There’s also no way to delete your will or account once created. I assume you have to ask them (and then trust that it’s actually deleted instead of disabled). After considering it, and in light of all of the news of hacks recently, I think doing a will offline is a better idea. We take every reasonable measure to protect our customer’s personal information. Not only is this the right thing to do, it’s also important to us personally because we all use Willing to create our own estate planning documents. Per your point about deleting your will, we are happy to do this any time. Please email us at hello@willing.com and we would be happy to help. Please clarify the exact technical process used to delete customer documents upon request and what service is used for storage, assuming that Willing uses aws, azure or some other cloud provider for backend services. Hi, So just clarifying – I live in WA – and this will form will be accepted legally here? Thanks so much. Yes! Willing’s legal forms are legally valid in all 50 states. Why is there a groupon ( $39 for a couple) for this service, if the service is currently free? Creating a basic will is always free on Willing. The Groupon offer is for our Premier package includes a will, living will and power of attorney. The Premier package typically sells for $99 for a single person or $149 for a married couple. I have no phone number to contact your company, I started with $149 basic and you keep wanting to add more on. I just want my money back. You took it out before I even started . Thats no way to run a business . I just saw the Groupon offer also & was wondering the same thing. The $39 Groupon offer is for the ‘Premier Package which includes ‘You and Your Partner Including two Wills, two Living Wills, and two Powers of Attorney’. Groupon shows that the normal price for this is $149. But, when going to the the willing.com website I didn’t see any price information. I have the same question about the groupon!! What gives?? Why is the response from willing.com the exact same to all of these questions in regards to the Groupon? You have a standard response that is repeated Word for Word but you’re not actually answering the specific questions these reviewer’s are asking. You are generalizing the answer but avoiding the questions being asked. I’m sorry, but I had to respond. The reason Win is giving the exact same answer to the Groupon question every time is because it is the EXACT SAME QUESTION every time! What do you want them to tell you? Do you want them to give each of you a different answer when you have each asked the exact same question, just in a different way? Same question…same answer. Makes perfect sense to me! I would like to hear from Willing —Why pay for the $29 groupon for individual or $39 for partner when the website says it’s free? Is the free document at the website simply bait to get you to upgrade to something else to have a complete document? Where on your website of “willing.com” can I actually see the future costs involved for a will I create for myself and my spouse? is there a storage of information fee that is charged in order to allow access to update or change your will or other forms? We have all seen your response to previous questions relating to the “Groupon’ promotion but the questions of any stated fees on the actual website where never addressed. Plain and simple what fees are involved with this process of getting a premier package versus what’s stated on your website (FREE) that does not differentiate between any of the forms associated with the Groupon special? Is it free for everyone logging on to the site? All three of Will, Living Will, and Power of Attorney are on your website with no cost mentioned anywhere in plain site? Where are the cost listed? Thank you for writing. We charge $99 for the Premiere plan for a single person and $149 for a married couple. This plan includes a will, living will and power of attorney. I have seen several online “Make your own Will for free” sites that claim to have “free wills” but there is a cost to store the document on a server but I don’t see any cost for your three of Will, Living Will, and Power of Attorney . Is the “Will” document free and the others two have a cost associated with it? It seems as though it’s free to create the forms but saving them is where the cost comes in. Is that true? Once the forms are created can they be saved on a personal pc to update or change or do you need to have an access code to update your paperwork for a nominal fee? 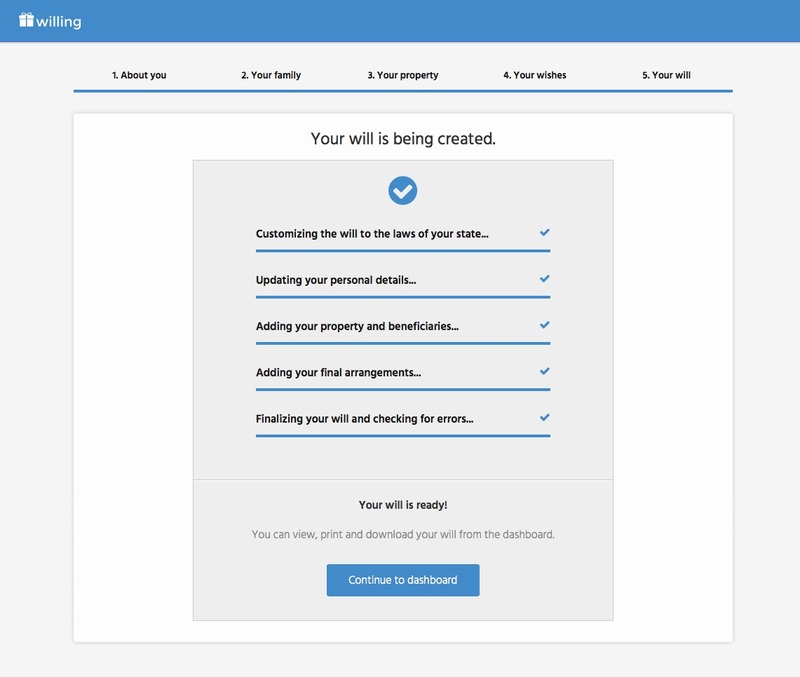 It is completely free to make, update, print and download a basic will on Willing. All of your information is automatically saved so you can come back at any time and update your documents at no additional charge. We also offer a Premiere plan for that includes a will, living will and power of attorney for $99 for a single person and $149 for a married couple. Interested but now in light of the groupon, and cost of storage concerns, and deleting files, uploading to pc etc, I would like to know the answer to the previous posted 4/4/2016 questions before I proceed. My questions too. Early questions and concerns were addressed by Willing in personalized, directed replies. Impressive. But now all the questions re: costs get the same boilerplate reply. I saw the groupon, went to your site and saw the “always free” promo. So why no link to a more extensive paid product, if that’s something you also offer now? Thanks for writing. We always have and always will provide personalized responses to each and every customer comment and email! Making a basic will is always free on Willing. We also offer paid plans that allow you to create more comprehensive plans such as a living will, power of attorney and revocable trust. Please email hello@willing.com if we can help in any other way! Does Groupon include the probate protection or will I still have to pay the extra $99 for that feature? Our offer on Groupon is for our premiere plan which includes the deluxe will, living will and power of attorney. It does not include the items to keep your home out of probate. Everyone is asking the guy the same questions! It seems to me however that the upgrades are either just now being advertised to get a bigger draw, or y’all forgot to put it on the website. ??? After you create your basic last will & testament, you will able to see all of our upgrade options. Email us at hello@willing.com if you have any other questions! Can we get a list of the upgrades and their costs NOW? Can you specifically address the the cost of lifetime storage and the cost of making future revisions to wills, trusts, POAs and living wills after purchasing either the premiere or total peace of mind package? I can see that storage and revisions are available, but no cost is mentioned. Thanks. Hello SS, you can log back into your account at anytime to make changes, there are no recurring fees. Why are the specific questions regarding the Groupon, the future costs, etc. only being answered by one general response that is being used repeatedly Word for Word? The last answer to the question similar to this one was the exact same as all the others, you just left out the costs portion of the exact same response. If you have any specific questions feel free to email us at hello@willing.com! I used the software on Willing. Yes, I was charge for making a Will. $49.00 it is not free. $150.00 I believe are for these two items. I have since contacted Willing as I did find their billing confusing. The software was very easy to use. While our basic will is free, we do charge for our other documents. You can click “Continue with Free Version” or “I’d Rather Do This Later” if you do not want to upgrade to our other offerings. After upgrading to one package, you can upgrade to the next package at a reduced price. It looks like you upgraded form package to package until you got our Total Peace of Mind package which includes the living will, power of attorney, and documents to keep your home out of probate. We are glad to hear you have already been in touch with someone at Willing, but you can always email us at hello@willing.com if in the future you have other questions. Is it possible to upgrade from the groupon Premier package to the Piece of Mind package at a discount? I can not get your site to take the code I received for Groupon. I need to know how to move forward, it only give me a place to add my credit card. Where do I go to enter the code??? I have send email already, this is 2nd time I am reaching out for help! I just went on your website and completed most of the requirements to set up a will. I did not complete the medical provisions, the home protection or the Legal protection sections which would require a cost upgrade. I expect I would do the upgrade for additional costs but I am unsure of “Willing’s” expertise and I would like to know how the company rates compared to others providing this service. I want to be sure I have the best company working for me. I had previously asked an attorney for a will draft but I have not agreed to use him. I noticed that my assets were to be listed as well as other things like insurance, medical coverage, disability of children, etc. 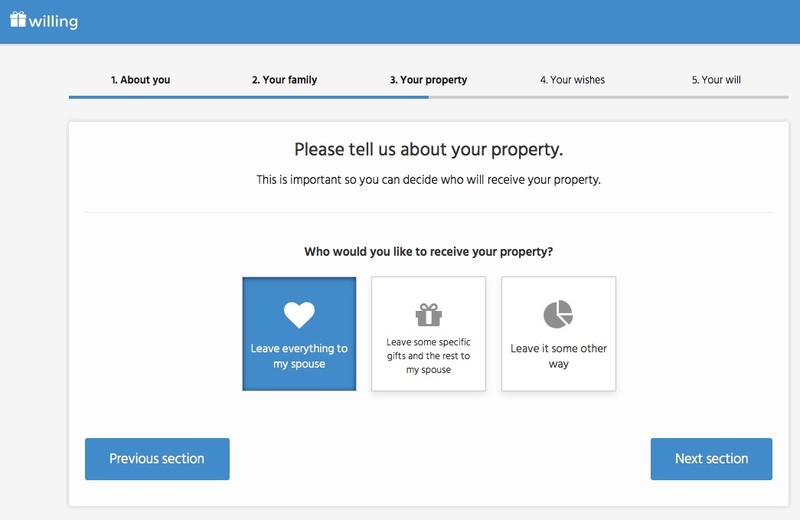 Why were these items not asked for in the online will shown by your company? Just to be clear, you are not on the Willing.com website. Please contact them directly. Folks, if you will simply call different lawyers, you will find that not all charge an arm and leg for a standard Will. Many solo lawyers charge far less that the $500 stated above and you will get an custom, drafted for you only, Will. The lawyers will also give you info, answer your questions, and make suggestions on how to handle your affairs and make your final wishes come true. Where I live, hospitals give people a Living Will form and a Medical Power Of Attorney form free – no charge. Most people do not need to give anyone a general Power Of Attorney. And no one (lawyers or Willing.com) ever tells people how Powers Of Attorney can be abused and used to steal money and property. When you give someone the power to take money out of your bank account, sell your home, mortgage your home, borrow money in your name, buy a car with your money, and so on, you better really trust that person. They can (and many have in the past) steal you blind. The key is to not be intimidated and call around. Some lawyers will be offended. Oh well, too bad for them. Many lawyers will not be offended and will actually be glad that you called. I got the “premier” or something package for 23.99 using a Groupon Deal with a promotional coupon. Seems to be valid through Feb 2018.